The engraving on Whitman Square is an adaptation of the poem “Song of the Universal,” in the “Birds of Paradise” section of Walt Whitman’s Leaves of Grass. The inscription expresses Wright’s concept of American democracy, borrowing and – at times – modifying Whitman’s words. Whitman Square was created under Wright’s direction in the early 1950s. Historically, students and apprentices maintained the Square by repainting the slab and the text. Every few years, when it appeared in need, this process would be repeated. During Wright’s lifetime, this solution was practical and accurate because he was able to make decisions regarding the legibility of the design that were true to his intentions. However, after his death, the well-intentioned repainting of the background and lettering continued, and layers upon layers of paint began to hide the dimensions and definition of the lettering. Cracks formed in the slab during Wright’s lifetime had expanded significantly, making the text more difficult to read and the overall appearance of the Square unlike his original intention. When Fred Prozzillo, the Frank Lloyd Wright Foundation’s Director of Preservation; Christina Varvi, a senior conservator at architectural conservation specialists Rosa Lowinger & Associates; and Tom McClintock, a conservator specializing in ethnographic and archaeological works, assisted by Foundation Board member T.K. McClintock, developed the latest conservation project for Whitman Square, they wanted the results of their conservation efforts to be as accurate and long lived as possible. The main objectives of the team’s efforts were to remove the later layers of paint to reveal the original transcription, stabilize the cracks, fill the areas of loss in the concrete, and repaint the slab. To begin, the team traced the most recent transcription onto a sheet of Mylar. A photographic technique called Reflectance Transformation Imaging (RTI) photography was applied above the square to obtain an interactive image that allows the user to adjust the light source. The RTI technique gave the team a better understanding of how much of the original inscription remained. With the digital image produced from the RTI technique, the team created a digital tracing of the lettering. The team used two chemical paint strippers to remove the paint. The paint strippers were chosen based on environmental impact, health impact, speed, and effectiveness. Remnants of paint were also carefully removed with a scalpel. As the layers of paint were removed, the team discovered that the gold lettering had become much wider than it was during the time of the Square’s creation. To adhere the walls of the cracks to each other, which would stabilize the cracks and prevent future damage, the team used three different fillers in succession. The first filling material used was a microcrack injection grout. The material was very fluid, and injected into cracks smaller than 5mm with a syringe. The second material used was slightly bulkier. As both materials dried, cotton was stuffed within the cracks or burlap was placed on top to prevent the materials from drying out too quickly. The final material used in filling the losses was a latex modified cementitious mortar, the bulkiest of the three materials. To ensure proper bonding before the material was applied, a wetter version of the mixture, known as a slurry, was applied to the surfaces. Custom masonry paint was ordered and created specifically for this project. The team required that the custom paint be reversible, able to stand up to extreme weather, and relatively colorfast. The team chose the color of the red paint based on what they believed was closest to what was available during the time of the Square’s creation. One layer of primer and two layers of red paint were applied to the Square. After the final application of the red paint, the team applied the gold lettering. Applying the acrylic paint only in the engraved areas, the team followed more closely to what they believed was the original lettering based on their observations made earlier in the preparation and paint removal phases. The application of the gold lettering was the final step in the team’s conservation efforts. The Frank Lloyd Wright Foundation will continue to care for the condition of the Square and will use this project as a case study for how preservation efforts can strive for long-term sustainability. 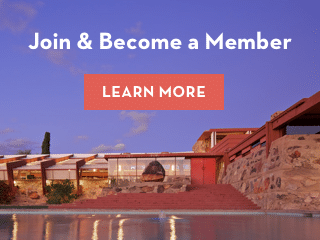 To see Whitman Square, plan your visit to Taliesin West today!